“Deconvolution” is a term often applied to the process of decomposing peaks that overlap with each other, thus extracting information about the “hidden peak”. Origin provides two tools to perform peak “deconvolution”, depending upon the existence of a baseline. We have put together an Origin Project (OPJ) that includes two folders: the Multiple Peak Fit Tool folder and Peak Analyzer folder. You can download this OPJ file (Peak_Deconvolution.zip, 22.7KB) to learn how to perform peak deconvolution. 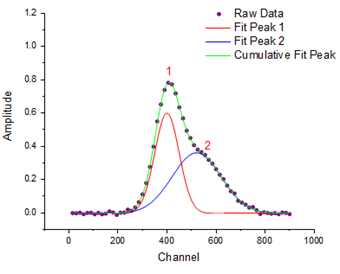 Visually pick and fit peaks around chosen peak centers using the Multiple Peak Fit tool. 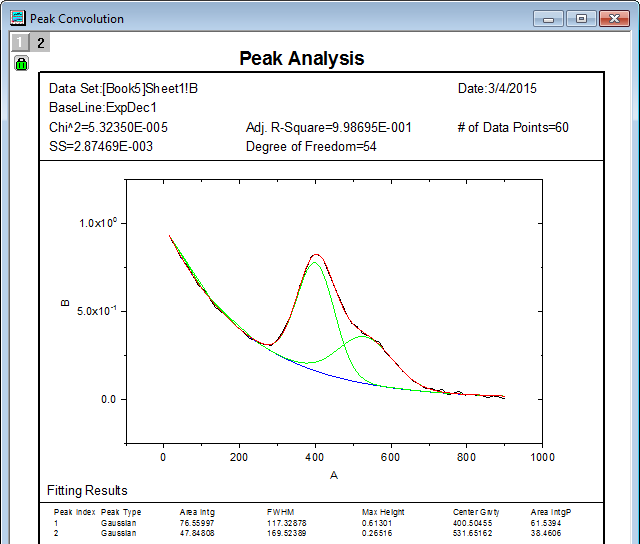 Detect the baseline and fit peaks while simultaneously fitting a baseline using the Peak Analyzer. Go to the menu Analysis: Peaks and Baseline :Multiple Peak Fit to open a dialog. 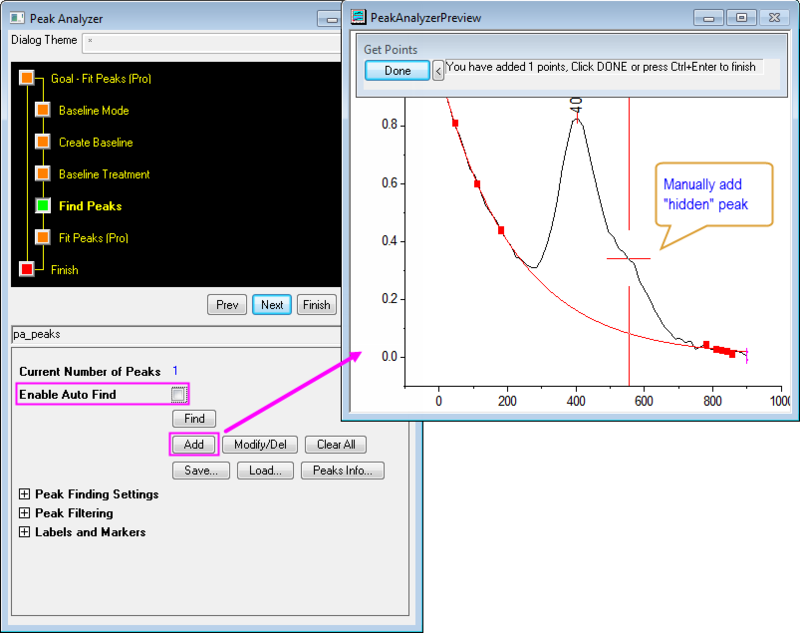 Select a function from Peak Function drop-down list for fitting and click OK to proceed to locate peaks. 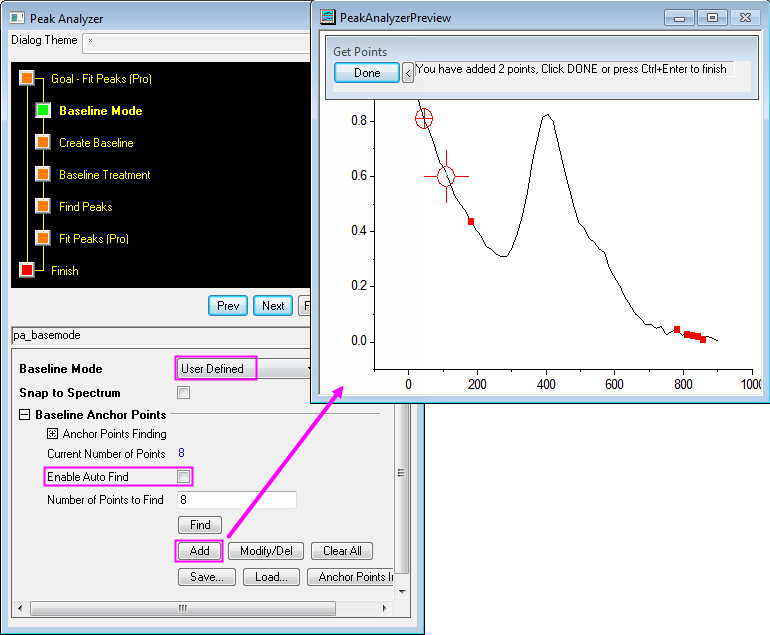 Point your mouse and double-click on the desired peak positions to add peaks. 4. Click the Fit button in the Get Points dialog to fit all specified peaks and the detailed results about each peak will be summarized in a table. To open the Peak Analyzer wizard, you need to go to the menu Analysis:Peaks and Baseline: Peak Analyzer. When the wizard opens, a preview window is automatically generated in order to provide real-time monitoring of the fitting process. Set your Goal to Fit Peaks (Pro)(available in OriginPro) to initiate the process. Select User Defined from the Baseline Mode drop-down list and you will see the auto-determined anchor points. Uncheck the Enable Auto Find checkbox to enable editing anchor points. Click the Modify/Del button to move existing anchor points to their proper positions or delete bad ones. Click the Add button and double-click desired positions on the curve to add more anchor points. When the anchor points are determined, you can either connect them by interpolation or fit them. To interpolate the anchor points, select Interpolation from Connect by drop-down list and choose a method from Interpolation Method. To fit the anchor points, select Fitting(Pro) from the Connect by drop-down list and select a fitting function from the Function drop-down list under the Fitting node. Click the Find button to find ordinary peaks. Uncheck the Enable Auto Find checkbox and click the Add button to manually pick missing peaks. Double-click on desired peak positions to add peaks and click Done. 4. Click the Fit button in the next page and the Finish button in the middle panel to fit. A report is generated with detailed information about the fitting and each peak. 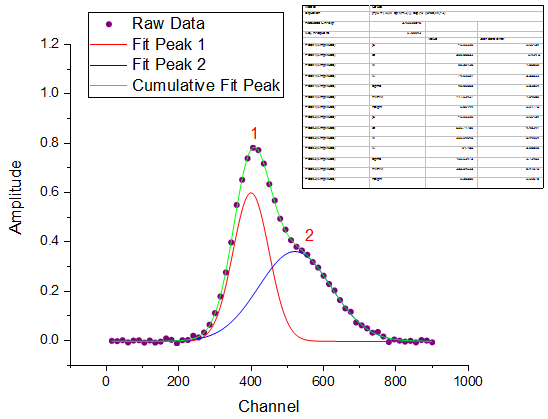 I request notes on deconvolution of single peak , multiple peaks. I tried by watching YouTube I can’t get please would you mind provide explicitly. Fit Peaks is an OriginPro feature. Could you check if this video helps? Are you using the data included in blog or your own data? If you are using your own data, could you send an opj with failed deconvolution to tech@originlab.com so we could take a look? In the second example, the baseline is obtained by connecting anchor points with a exponential decay function as described in the blog. 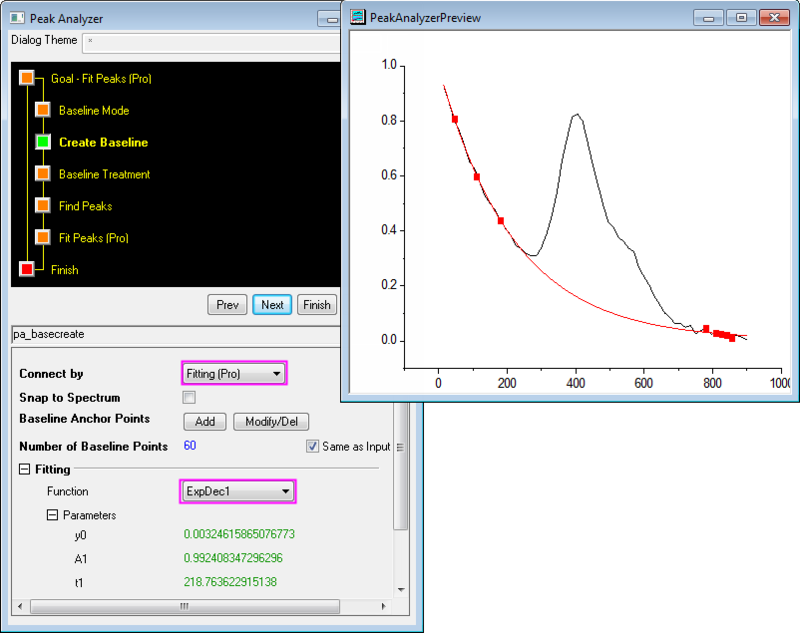 If extracting baseline using interpolation with BSpline, the fitting is also converged. Can you email your opj to us via tech@originlab.com so that we can help you further. Hello, Origin 8.1 is very old so it may only have 3 functions for multiple peak fit. Please consider upgrading to the latest Origin which is more powerful. Hello… i’m using a old version and i have as parameters: chi^2, SS, COD, Corr Coef, degree of freedom. Using these parameters how can I decide if the fit was good? i’m fitting DRX spectra. Please see if http://www.originlab.com/doc/Quick-Help/measure-fitresult helps answer your question? this is a good method to deconvolute the TFIR spectra. But I meet a problem. I want to find 4 peaks, but every time I fit them, the last one would shift to a left position. Hello, is your goal set as Fit Peaks? Do you mean when finding peaks, it found the 4 peaks well, but after fitting, the 4th peak shifted to the left. On Find peaks page, there is a Fit Control button. U can open it and set a specific peak center to be fixed. Is there someone who can help me to find the “hidden peak” ? Hello, on Find Peaks tab, under Peak Finding Settings node, try to change method to 2nd Derivative or Residual after 1st Derivative which may find hidden peaks. where can I have origin programme? You can visit originlab.com and click Purchase. If you are located out side US and Canada, please check Distributor page. Why my Origin 8.1 SR3 only displays Gauss, Lorentz and Voigt options in the Peak Function of Multiple Peak Fit menu. I would like to fit with a GaussMod function. Yes, we added more fitting functions in later versions. In 8.1, there are fewer functions to choose in the menu you mentioned. In your Origin 8.1, maybe you can try using Analysis: Fitting: Nonlinear Curve Fit. Then you have more functions to choose from Peak Functions category. On Settings -> Advanced tab, you can set Number of Replicas. E.g. set it to 3 (if there are 4 peaks to fit). I want to Deconvolute my RDF diagram by this methods but I have a problem with this methods, Can anybody help me to solve? Could you let us know what you set in each step and which part failed? E.g. if you specified baseline and which type of baseline. How many peaks do you expect to find and how many was found. I find that it is very bad practice to mix the terminology of “peak fitting” and “deconvolution”, because deconvolution is a well defined mathematical operation which is not being applied here. So I applaude your putting this in quotation marks but would strongly suggest to avoid the terminology (like in the filename). i used this method for quantitative analysis and the results were verified by other methods. really interesting and simpler.